This article is about the Mario enemy and item. For other bomb-related articles, see Bomb. Artwork of a Bob-omb from Mario Party: Star Rush. Bob-omb (ボム兵, Bomb Trooper) is an item that has appeared in every game of the Super Smash Bros. series, originating from the Mario series. It acts as a powerful, explosive throwing item in all of its appearances. Official artwork of Bob-ombs from Super Mario World. Introduced in Super Mario Bros. 2, Bob-ombs are bomb-like enemies that walk around, exploding after a short time. Jumping on a Bob-omb (except in Super Mario Bros. 2) stuns it; in this state, it can be picked up and thrown, defeating enemies and destroying blocks with its explosion, which can also damage the player. If it is not thrown quickly enough, the Bob-omb explodes on its own, also damaging its holder. In Super Mario 64, Bob-ombs react to Mario if he comes close enough to them by igniting themselves and chasing after him. They can also be grabbed, and when thrown they explode immediately upon coming into contact with anything. Bob-ombs can be picked up by any player and subsequently thrown at opponents. Being an explosive, the item can easily inflict large damage and knockback to other players, but it can also potentially harm the attacker. 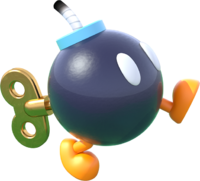 Bob-ombs also explode if they are simply hit by an attack. When a Bob-omb is held by a player for a while, it will begin flashing red, and shortly after will automatically explode in the holder's hands. While it is flashing red to signify its imminent detonation, it will be more powerful than usual, but it is also close to exploding, making for a risk-reward scenario. A held Bob-omb can also be detonated in the holder's hands if they are attacked and the attack hits the Bob-omb. If a Bob-omb is not picked up, after a while, it will stand up and begin to walk back and forth on the platform it spawned on, turning around at edges. In this state, it will explode if it walks into a player. In Super Smash Bros. 4, it is possible to pick up the item just before it starts walking. If it has not exploded after a brief period of walking, it will stand still while flashing red, and then explode, causing damage and knockback to anyone nearby. In SSB4, if a Bob-omb is close to any fighters, it will walk towards them when it starts moving, making it more dangerous than in previous games. In Super Smash Bros. Ultimate, Bob-ombs will meteor smash opponents when thrown downward. Otherwise, the knockback is diagonally upward as with previous installments. In addition, Bob-omb explosions will no longer harm the user. Much like Gooey Bomb before it explodes, characters will have a surprised look if Bob-omb is about to explode near them. The Bob-omb is also one of the various unusual items Peach can pluck via her Vegetable special move. The chance of her plucking a Bob-omb is approximately 1/232, but in all games she has appeared in, it can potentially act as her most powerful attack. If a Sudden Death match lasts for too long and a winner hasn't been announced, Bob-ombs will begin to fall from above the stage, instantly exploding upon striking players or the stage. They are intended to end a match more quickly, but can still be grabbed in midair. These Bob-ombs can be avoided by camping in certain places on some stages, but on most stages there is no completely safe position that can be occupied indefinitely. They can also be avoided by stalling on edges, but this also cannot be done indefinitely except through planking. They can not be absorbed or reflected. The falling Bob-ombs do not appear in Super Sudden Death. In Super Smash Bros. for Wii U, the Bob-omb is a red item trophy in Smash Tour. When used, the player will start the battle holding a Bob-omb. These little guys are just what they appear to be: walking bombs. Pick one up and hurl it for an incredibly potent attack. If no one picks them up, Bob-ombs light their own fuses and start wandering around armed and dangerous. In Super Mario 64, Bob-ombs chased Mario down once they noticed him. Pink Bob-ombs are nice and capable of speech. A mobile bomb with a fuse on its head. It can be picked up and thrown as a powerful explosive, but if no one grabs it, it will tire of waiting and start wandering, then detonate whenever it likes. Its power and unpredictability make it an accident waiting to happen. In sudden-death matches that go on too long, Bob-ombs rain from the sky to move things along. The Bob-omb trophy appears in both versions. In Super Smash Bros. for Wii U it is part of the Super Mario Bros. 2 & 3 Trophy Box. This enemy lacks any kind of subtlety— a fuse on its head, a slowly turning key in the back, and two short legs to carry its little bomb body. You can figure out what happens next. When a Bob-omb starts flashing, you better start running! A bomb for a body, burning fuse on top, two little legs and a wind-up key spinning away on the back... We probably don't need to tell you what's going on here. Now, that doesn't happen too often! Then again, who knows? Maybe some people will look at a Bob-omb and think it's an eight ball having an identity crisis. In addition to the above, equipping the Linde, Paz Ortega Andrade, Bomb Man or Risky Boots Support Spirits will give the player a Bob-omb at a start of a match. Artwork of a Bob-omb from SSB. 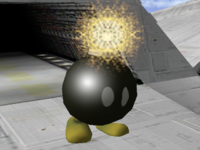 Artwork of a Bob-omb from Brawl. A still Bob-omb beside a walking Bob-omb in Smash 4. Artwork of a Bob-omb from Ultimate. King Dedede inhaling a Bob-omb in Ultimate. The noise Bob-ombs make when they wander in Melee onward resembles the noise Green and Red Shells made in Super Smash Bros.. In Super Smash Bros., using Fox's Reflector on a walking Bob-omb will make it one-hit KO him. Alongside the Home-Run Bat, it is the only item in the game which can perform a one-hit KO. In Super Smash Bros. for Wii U, CPUs will have odd behavior when they happen to hold a Bob-omb; they may either throw it as soon as they pick it up (which is dangerous) or go to a random location and never throw the Bob-omb, most likely leading to their death. This erratic behavior also happens in Training Mode with CPUs that are not in "Attack" mode. This page was last edited on April 2, 2019, at 16:27.